There are currently 85,134 users on this website. Don't you all mean small SD or tiny SD in the above few posts? Yes but as hans g said the position of the echidna differs too, and at least that's what I use when checking coins from change. How many anniversary 2016 5c pieces have you looked at? I've only seen maybe eight in total which is hardly enough to say they're all tiny SD for sure. Me too. Unfortunately the tiny SD description is firmly entrenched. Thousands I'd guess. But they are all sourced in Melbourne so what I am seeing is mainly coins released here. Oh nice - I think it's safe to say they don't exist then. I haven't seen a whole lot 2017 5c pieces yet (and only have an unopened bag of 2018 5c pieces from the Road Show) but given the last circulating one was 2014 I don't expect there will be many if any. I've now looked through 43 2017 5c pieces and they're all tiny SD/high echinda (unsurprisingly). Hi all. I was just wondering if it was possible that the 1984 5 cent had 3 varieties? The (top coin) low sd has a similar rim to the middle coin yet the bottom 2 coins have the same echidna. I think there are only two varieties - the rims on these coins can be pretty variable (quite a lot have the little inside rim like the top and bottom coins). Cheers Mr T, I appreciate the reply, I realize that I am a noob and there r probably a lot of people rolling there eyes at my question lol and I know I still have a lot to learn, but for some reason I really enjoy noodling( bit of ocd maybe), so do u think it is PMD or die change? Also can u recommend a few good sites to do some homework? 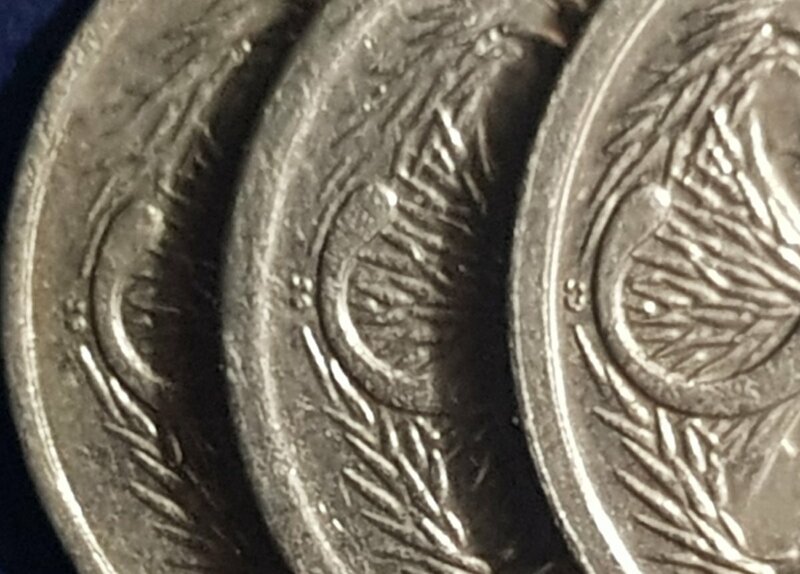 I'm not sure what the cause was but you sometimes see coins with rims that slope down to the design rather than being a vertical edge (possibly die wear?) and sometimes you see a small lip inside the rim (not sure what causes it) but they can make it a real hassle to identify coins with designs that either near to or far from the rim. https://www.australian-coins.com/ is a pretty good resource. Is the 1976 you've found an upset? 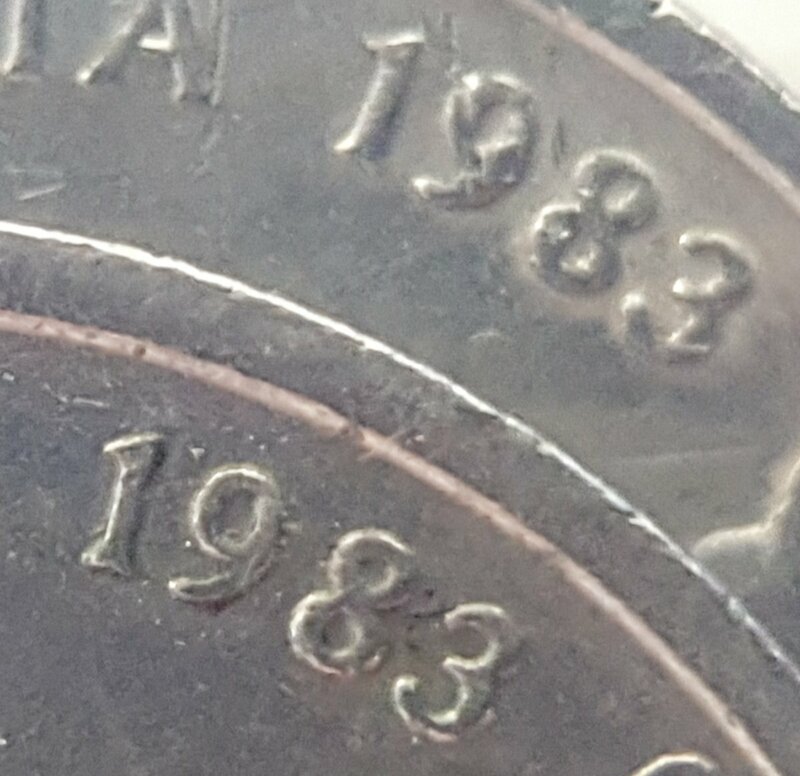 I don't look at the 1983s only because there are no varieties reported - what have you found? I've seen one 2018 too and it's a high echidna. Hi Schoza, any chance of placing one of you 1976 upsets in a 2x2 and taking a pic of each side? I have just had a quick look (turned them between my fingers) at 260 of the 1976s and found none. Just wondering if the rotation is so slight that I missed them. Also interested to hear what you have found in the 1983. The font looks slightly different and the distance between the numbers aren't the same. Yeah it does look like a different font. I guess it wouldn't be surprising - the dies were hand-made for the longest time. True MrT, that year 130 million coins were struck, I get the top coin was struck through and that as a result it has a feathered look but the top of the 3 was what made me put it out there, plus the distance between the 8&3 also made me think.